This Off-Road Front Bumper is specifically designed for use on 1987-1995 YJ and 1997-2006 TJ Jeep Wranglers. Direct bolt on for TJ models; Drilling may be required on some YJ applications. u-Box Off-Road Front Bumpers are engineered to be a direct bolt-on upgrade using just basic hand tools, so there is no drilling or cutting required for a clean straight forward installation. This Off-Road Front Bumper features built in LED lighting in both factory sized cube light housings for impressive styling. These LED accents not only look great, but also help you “see and be seen” even on the darkest trails to provide additional safety. Featuring two high strength D-Ring mounts, and two built in LED rectangle lights, the Off-Road Front Bumper is perfect for off-road use. Each bumper comes equipped with two 3/4 inch pin d-rings able to handle a load of 9,500lbs making them perfect for recovery. 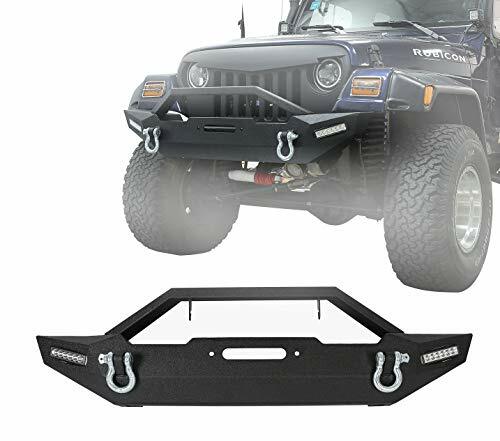 Manufactured from 5/32″ mild steel plating and 2″x0.120″ tubing this u-Box Off-Road Front Bumper is completed in a two stage finish using epoxy pre-coating and high-grade textured black powder coating for long lasting durability. The D-Ring mounts are welded both inside and outside for extra strength. Any problem,do not hesitate to contact u-Box customer service with Amazon Seller messages for help. Heavy Duty Front Bumper.Steel Construction. 2″ x 0.120″ Tubing.Weight: 61 lbs. LED Accent Lighting.High Strength, D-Ring Mounts w/ 9,500 lb Pull Capacity.